My Book and My Coffee welcomes Chrinda Jones, author of Darkness Knows Me, a mystery novel. Check out her guest post today about book promotions. I’ll Scratch Your Back, If You’ll Scratch Mine, or you scratch my back and I'll most definitely think about scratching yours - possibly, maybe . . .
FEE based promotions offer packages designed to fit any author's budget, from Daddy Warbucks to Old Lady in the Shoe. Clearly the more frugal packages are going to be pretty bare-boned compared to the higher priced options. Less time will be scheduled for promotion, less avenues will be sought for promotion, less time and help will be given to managing your promotion. . . you get the picture. Like anything else in this world, fee based promotion has its problems. Most fee based promotion companies are on the up-and-up, and provide a decent product/service. Others will take their tiny fee for their promotion package and honor just enough of their contract to keep them out of trouble. Others will promise much for the money you pay and produce terrible product and promote just enough to keep you handing over more money, until you’ve paid for more than you’ve gotten. The old adages ‘you can’t get something for nothing’ and ‘if it’s too good to be true, it isn’t.’ should be heeded when dealing with the cheap and not so cheap promotion deals. Fine print is not your friend with these companies, so read before you sign your book away. Many of these promotion companies will try to lay claim to your book rights once you sign with them, which mean they could try to dictate nearly every aspect of publishing, printing and promoting your work. I’ve read horror stories from fellow authors who are still struggling to get there books back. FREE promotions sites (I love the sound of this particular 'f' word) are free just like they say. There's usually no charge to join, no hidden fees once you start promoting and they don't take a hunk of your book profits. The only cost is your time, your lists of social media contacts and your willingness to follow directions. These sites are usually always set-up by other authors for the purpose of promoting themselves as well as other authors who want to hop the bandwagon and share their social media connections in pursuit of mutually promoting their works. This is self-promotion at nearly its most primitive. These groups use a weekly or bi-monthly (usually a genre focused push) of participating author's works, with a rotation of featured novels during the same genre promotion. However, like anything else, you have to go in with your eyes open. Since joining two of these free sites, I have learned a few things right out of the chute, which I will share with you, free of charge. First: The 'I'll scratch your back, if you'll scratch mine' thing only works if the other person is willing to do some scratching. Don't go into this thinking everyone shares the mindset of being helpful. Many people who join these sites have no intention of participating or using their contacts to help anyone but themselves. Plan on being a scratcher. Second: Don't get sucked into the 'I'll read and review your book, if you'll read and review mine' cycle. It's only helpful if the person asking for your review has some social media clout or access to places you don't. Otherwise you're caught in a cycle of buying from and selling to authors, which defeats the purpose of joining. Third: Be protective of your social media sites and followers, because desperate people will spam the be-jibbers out of your sites if you give them access, which could cost you contacts. I can't say I've seen much in the way of new sales generation from the sites I've joined, but then it's only been a few weeks. I figure a little more time will tell the tale. Have experiences you would like to share pertaining to book promotion of any sort? Please share with us in the comment box. Richard McMann hangs by his arms from the rafters of Red Curtain Club- naked. His ankles are bound together and his throat is cut in what appears to be a gruesome still-life tribute to Christ’s crucifixion. There is no blood in spite of the gaping wound to his throat and his entire body is covered by what looks like a fine white powder. The salt granules scattered on the dance floor beneath his feet and the fact that his body faces due east, make his murder different yet similar to the death days earlier in a club a few blocks away. South Dallas police detective, Olivia Gates and criminal psychologist, Dr. Will Green, engage in a game of wits with a serial killer who haunts the nightclubs of Deep Ellum, leaving behind ritualistic sacrifices of those people he believes deserving of the act. Is he a raging psychopath, killing just to kill, or is there method behind his madness? Chrinda Jones was born in 1964, in Sacramento,CA. She lived the first 30 years of her life in Oregon and has since lived in several different states across the U.S. She began learning to write in earnest when her four children started leaving the nest. 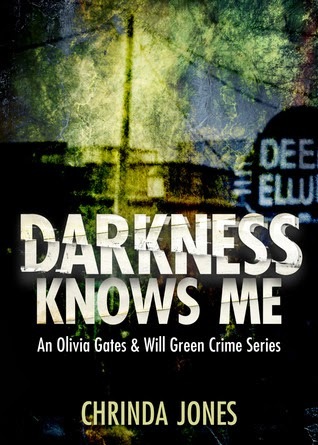 She is the author of the Olivia Gates and Will Green crime series set in Dallas, Texas, of which “Darkness knows Me” is the first installment. A musician and lover of books, she lives in Murphy, Texas with her husband and her Jugg, Abby.